Complexity, Agility and Resilience. | Be prepared to appreciate what you meet. Very important talk from John Seely Brown about accelerated (exponential learning) and the transition from the push economy to the pull economy. In this wide-ranging talk we are introduced to how aerial surfing and the world of warcraft can teach how businesses can get scale without mass. The Atlantic recently posted a very good review of the systemic reasons why our armed services are losing many of their best officers. This article nicely summarizes the advantages culturally present in the military while contrasting the enormous bureaucratic challenges faced due to inflexible personal and staffing mechanisms. Several solutions are provided based upon recommendations and surveys from veterans and active service members. The impact of fostering a culture of innovative thinking while also developing entrepreneurial leaders is dramatically curtailed without also using a decentralized staffing ecosystem which values merit, ignores seniority and facilitates mobility, agility and personal choice. The military system is familiar and capable of radical change. The reformation in the armed services when they moved to an all volunteer force dramatically increased the quality and experiences of those serving in the armed forces. After the change to an all volunteer force “the military filled its requirements for labor with the right price: better pay, better housing, better treatment, and ultimately a better career opportunity than it had ever offered”. The top suggestions for improvements included: breaking down the rigid promotion ladder (most service members can accurately predict their next promotion to the day), allow for specialization and letting people stay in the same career for as long as they want (all I want to do is fly airplanes), adopt an internal job market where commanders are solely responsible for hiring and acquiring talent. 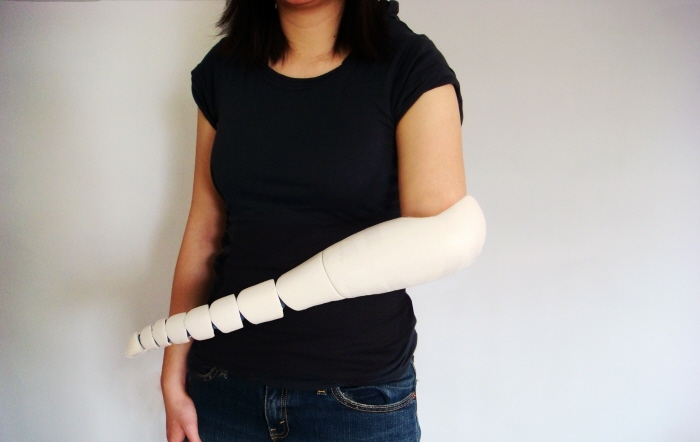 In a wonderful departure from more traditional prosthetic design Kaylene Kau created the tentacle add-on. Some people approach difficult situations by first searching for the point where they can apply a small amount of pressure and make a very large change. Seemingly they do little and big changes occur almost magically. A particular mindset and approach to solving problems helps me find significant leverage. When solving problems I intentionally search for leverage points, I intentionally look for big ideas which can act as a beginning focus for building effective solutions. In general when I search for leverage I only find fragmentary solutions or kernels of ideas. This means that I have to build a solution around the good idea; I have to fill in the remaining details, thereby exploiting the insight to the fullest. A good example of finding points of leverage to solve problems is found in one of my favorite mental domains. Rock climbing. Imagine you are a climber approaching a particularly tough pitch. You are moving from hold to hold, and you know that holds do not have context-free features – meaning that their ability to propel you up the mountain is determined by both you (are you tired? hands slick from sweat? particularly tall or short? ), their shape and size (rough or smooth rock, large or small hold, vertical or horizontal orientation and/or size) and the environment (is ice present? has it rained?). To succeed you must constantly re-orient your thinking and approach as you plot your moves and execute them. You must continuously look at each new position and analyze the many aspects of what you observe while cross referencing your implicit and explicit knowledge to synthesize subtle adjustments to your approach. This process allows a climber to continue to move safely and efficiently to a summit while continuously being confronted with new terrain and context. It is this same mental exercise we use when we examine problems in search of points of leverage. In practice how can you do this for novel problems? First have a clear understanding of several different definitions of what success looks like in your problem domain. Review your problem from several different angles and viewpoints, think about both your explicit and implicit resources and constraints. Then look at several potential solutions by mentally simulating several steps forward from the very first step and by working backward from some defined success condition. As you think about the problem recursively apply a process of analysis by breaking the problem into smaller and smaller pieces. Look at the different aspects of each small piece and search for and review novel solutions to each. Keep imagining different solutions and as you review and decompose your problem you will likely find an area where you can generate leverage. As you go, keep evaluating what success looks like – it may be possible to redefine your goals as you understand the problem more deeply, this may help you find new areas where you can apply pressure to get the results you want. Also look for and avoid choke points. Just as we can spot points of leverage, we can also discern scenarios where particularly large or unexpected resources are required. In our rock climbing example the avoidance of dead ends or approaches which need heroic efforts to summit should be avoided. Another example from business of finding a tremendous point of leverage was Boeing’s leap of faith taking us into the jet age of transport. When Boeing’s engineers saw the advantage jet engines have over propeller driven aircraft they surmised that they could realize a significant competitive advantage. Of course they now had to build jet engines and the planes to go around them, but once they did the market for passenger jet aircraft was immense. For more reading on problem solving and finding points of leverage read “Sources of Power” by Gary Klein. I bounce between using notebooks, text files and speciality forms for staying on top of my work day by day. Lately I have used some specialty forms created by David Seah. His beautifully intuitive forms caught my attention a while ago and I have used them on and off to track my progress on projects and understand how I spend my time. The latest tool I have been using is called the Emergent Task Tracker and it is a great example of David’s work. I have found that it is missing a few pieces, therefore with all props to David I have made my own version, it heavily leverages David’s format (I am not nearly as visually capable as he is), but adds a few missing items which will help me think about my goals and approach to work. The specific items I have added are explicitly noting my estimated time vs. actual time for tasks and their classification. The classification angle is probably the largest single addition to the original Emergent Task Planner. Put simply I think it is crucial to understand the nature of the tasks I undertake. Therefore I categorize my tasks as fitting into several niches: Relational, Objective, Essential or Emergent. The idea being that I need to do a mix of different types of tasks each day and week. Relational tasks are those which primarily exist to create or support relationships with colleagues, coworkers and folks in my network. This could be a coffee break with a friend at work, attendance at a networking event or a quick note of support to a colleague. Relationships are so important, you have to make sure you intentionally make time to build them. Objective based tasks are those that further one of my ongoing projects, this could be research and writing about new software or technology, coding a new function to expand some functionality in one of our prototypes, or holding a meeting to inform our organization about one of our goals or findings. Essential tasks are those that you must do each day or week, these would be things like update emails to my manager or other senior management, system administration like backing up my work, arranging or cleaning my workspace. Often relational tasks are also essential. Emergent tasks and emergencies. These will always happen and understanding how much of your work is interrupt driven is the first step to managing your time and other’s expectations. Minimize these. On a daily and weekly basis I review my progress towards my goals and assess if I am spending my time as wisely as possible. Here is the form.